Young Virat Kohli and skipper Mahendra Singh Dhoni held their nerves under pressure with fighting knocks as India survived a few jitters before scripting a comfortable five-wicket win over New Zealand to complete a 2-0 whitewash, here today. Surprising as it may sound but Sachin Tendulkar's defence has been breached three times in a row in the ongoing series. India captain Mahendra Singh Dhoni praised Virat Kohli for showing "excellent temperament" during team's tricky yet successful run-chase against New Zealand in the second cricket Test, here today. Former captain Rahul Dravid today lavished praise on Virat Kohli, terming him the "best Indian batsman" on current form, and said that anchoring the stiff run-chase against New Zealand would do his confidence a world of good. Novak Djokovic continued his stroll through the U.S. Open draw on Sunday while former champion Andy Roddick staved off retirement by winning in front of 20,000 of his new-found best friends at raucous Arthur Ashe Stadium. India’s third consecutive title victory in the Nehru Cup International Football Tournament was a perfect gift for the All India Football Federation’s 75th anniversary celebrations. Set a target of 261, the Indians were in a spot of bother at 166 for five at one stage with three wickets falling in quick succession before Kohli and skipper M S Dhoni steered the team home at the Chinnaswamy Stadium with an entire day to spare. Dhoni smashed a six off spinner Jeetan Patel to finish off the match in style and in the process became the most successful captain by winning 14 Test matches at home, eclipsing Mohammed Azharuddin's record of 13 wins. As the ball sailed over deep mid-wicket, scenes of wild celebrations erupted at the stadium while the Indian players stood at the dressing room to applaud the heroics of Dhoni (48) and Kohli (51), who put on an unbeaten 96-run partnership to guide the team home. New Zealand made an emphatic comeback in the final session picking up wickets of Sachin Tendulkar, Cheteshwar Pujara and Suresh Raina in quick succession, which jolted the Indian dressing room for a brief period. 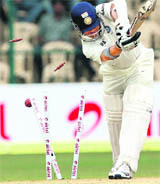 Tendulkar lost his middle stump, while Pujara was snapped up by Daniel Flynn at forward short leg. Raina, who had pulled out India from a hole in the first innings with his magnificent 55, threw his wicket with a reckless shot as he was castled by Patel. Dhoni and Kohli, however, took the attack to the New Zealand's territory, treating Patel and Tim Southee mercilessly, hitting boundaries at will. Dhoni and Kohli particularly targetted Patel to unsettle him as he was getting some turn and bounce on the uneven fourth days's wicket. A six by Dhoni off Patel infact prompted Taylor to bring in paceman Tim Southee who put brakes on the duo for some time. Earlier, a steady and unbeaten 64-run stand between Pujara and Tendulkar helped India reach 147 for 2 at tea, needing 114 runs more to win on a rain-hit fourth day. 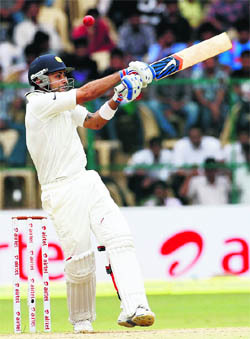 Pujara was batting at 41 and Tendulkar at 23 when the play stopped and did not resume resulting in an early tea break. Resuming the play after lunch, New Zealand pacers Trent Boult and Doug Bracewell bowled a disciplined line, mostly attacking the stumps making it difficult for Tendulkar and Pujara to score freely. New Zealand pacers had a plan cut out for Tendulkar, making him play most often, as he was not in great form. They had Tendulkar in a spot of bother after the Mumbaikar survived two loud appeals for an LBW off Boult and Bracewell. Pujara broke the shackles by plundering 12 runs in an over, dispatching Boult for a couple of exquisite boundaries, taking India’s total past 100. Tendulkar then turned the screws on against Bracewell thumping him for two consecutive boundaries. Southee, in his second spell after lunch, made most of the uneven bounce by swinging and banging in the ball short to trouble the batsmen. On 37, Pujara got a life as stand-in wicketkeeper Brendon McCullum missed a straightforward stumping chance off Jeetan Patel when India were 134 for two. Tendulkar unleashed a couple of delectable shots off Southee, first standing tall punching off the backfoot and driving through offside, much to the delight of the boisterous spectators. Earlier, the openers gave a rollicking start to India's chase before departing in quick succession as the hosts reached 88 for two at lunch. Virender Sehwag (38) and Gautam Gambhir (34) put the Kiwi attack to sword to give a perfect start to India with their entertaining stand of 77 in under 12 overs. As India raced to 77, Taylor brought Patel, who did not disappoint the captain. Patel flummoxed Sehwag, who struck seven fours and six, with a flighted ball which disturbed his off stump. After Sehwag's dismissal, the runs dried up and that brought New Zealand back into the game. After winning the toss, New Zealand posted 328/6 in 81.3 overs on the first day as captain Taylor smashed a century off just 99 balls. He fell for 113, which included 16 fours and two sixes. Left-arm spinner Ojha, who opened the bowling, picked up 4/90. New Zealand were bowled out for 353 as Ojha ended up with 5/99. India lost wickets regularly and were in trouble at 80/4. Kohli then led the fightback, adding 99 runs with Raina and 122 with Dhoni. India were 283/5 at the end of the day. India lost their last five wickets for 52 runs to be bowled out for 353, conceding a first-innings lead of 12 runs. Southee took 7/64. 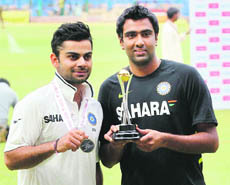 As New Zealand batted again, Ashwin took five wickets once again, reducing the visitors to 232/9 at the end of the day. New Zealand set India a target of 261. Sehwag and Gambhir added 77 but fell in quick succession, India 83/2. Pujara and Tendulkar added 69 runs before Tendulkar, Pujara and Raina fell. India still needed 95 at this stage, and Kohli and Dhoni coolly took India home. With his 14th Test win, Mahendra Singh Dhoni, who led from the front yet again, becomes the most successful Indian captain in home Tests. He went past the previous record of 13 wins set by Mohammad Azharuddin. The target of 261 is the highest achieved in Bangalore. India's total is also the highest ever made in the fourth innings in Tests in Bangalore. 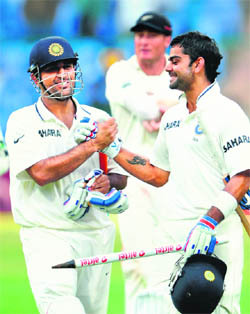 The 96-run stand between Virat Kohli and Dhoni is the third-highest sixth-wicket stand in the fourth innings for India. The highest remains 136 between Sachin and Nayan Mongia in Chennai in 1999. 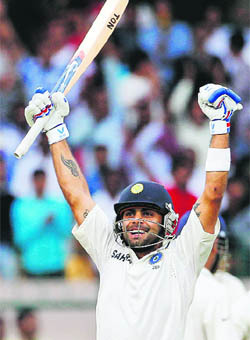 Virat Kohli became the sixth India batsman to score a century and fifty in the same game against New Zealand. Rahul Dravid is the only Indian batsman to score a century in both innings against New Zealand. The 77-run stand between Gautam Gambhir and Virender Sehwag is the first fifty-plus opening partnership for India since the 67-run stand against W Indies in Mumbai in 2011. For the fourth time since 2010 and the second time this year, India's top four batsmen failed to score a half-century in the match. The aggregate of 218 runs (top-four batsmen) without a half-century is, however, the highest ever for India. Fall of wickets: 1-77, 2-83, 3-152, 4-158, 5-166. Bowling: Boult 16-4-64-1, Southee 18-3-68-1, Bracewell 14-3-52-0, Patel 15.2-3-68-3. Tendulkar was dismissed bowled for the third time in three innings. The last time he was out bowled in three consecutive innings was in 2002 in England. Only Rahul Dravid (55) and Allan Border (53) have more bowled dismissals, than Tendulkar (51). After being bowled in the first innings of the first Test in Hyderabad and the first innings here, Tim Southee made it three in a row when he disturbed Tendulkar's middle stump on the fourth day. Revered worldwide for his his sound technique and temparament, the veteran batsman's campaign in the two-match series got off to a poor start after Trent Boult cleaned him up for just 19, uprooting the middle stump in the first Test, and it continued in the second match here. Doug Bracewell went through Tendulkar's defence after he left a gap between his bat and pads in the first innings of the ongoing match. "Virat was superb with the bat. There are two ways to tackle the pressure. Either you fight through it or you just soak it, and I believe Virat really batted well. He showed excellent temperament," Dhoni said at the post-match presentation ceremony. India were in a spot of bother after losing three quick wickets, but Kohli and Dhoni combined together to see their team home. "It seemed as if we were not playing in Bangalore but in Napier. Ashwin and Ojha combined well and they were ably supported by Zaheer and Umesh. There was something for the bowlers in the pitch. The New Zealanders got a bit more purchase from the wicket but our spinners were brilliant," Dhoni stated. He added that India has been led well by the bowlers since last few tournamnets. "They hunted in pack and that has been the case since past few series'," he said. Man of the match Kohli, who is in the form of his life admitted that it was indeed a "tricky situation." "It was a tricky situation when I went out to bat. Me and MS decided that we would target 10 runs at a time and it worked for us," the Delhi lad stated. Asked about the areas of batting that he has worked on, Kohli replied,"I needed to be more patient and it worked. There was more turn (on offer) today and it was a great wicket." Ravichandran Ashwin, Man of the Series for his haul of 18 wickets, conceded it was difficult to get wickets on this strip but felt that variation in pace did the trick for him. "This pitch was a bit more challenging. I tried to alter the pace on the third day, it was a bit more docile. I enjoy bounce, that's one of the important ingredients I require from a pitch," Ashwin said. He was also appreciative of Pragyan Ojha. "We have been together for around 16-17 years... He complements me well. I am happy that he got a five-for in the first innings," he said. New Zealand skipper Ross Taylor hailed his team for putting up a good fight in the second Test after facing an innings defeat in the first Test at Hyderabad. "We had our chances. The boys really showed great character to come back from a terrible Test in Hyderabad," Taylor said. He added that his team was in hunt once India lost few quick wickets, but gave credit to Kohli and Dhoni for they way they batted against the Kiwi bowling attack. "They lost five wickets for 50 runs in the first innings and once we got three quick wickets during the second innings we believed we were in with a chance. But the way Kohli and Dhoni batted was outstanding," he said. Taylor also praised the Bangalore wicket. "You can't ask for more in a Test pitch. It had a bit of bounce and also spun towards the later half of the Test," he said. New Delhi: Virat Kohli's childhood coach Rajkumar Sharma is extremely proud of his ward's performance against New Zealand in second Test match which concluded at Bangalore today. "I have always felt that Kohli is a better player of longer version than ODIs. Today I am happy that he is on his way to establishing himself in the Test team. Virat has been phenomenal in ODIs but he has the correct technique, temperament for Test matches," Sharma told PTI Bhasha today. "Virat has today proved that not only is he a competent ODI cricketer but also a good Test cricketer." What has satisfied Sharma is the fact that both centuries and the match-winning half century today came under trying circumstances. "Both in Adelaide and in Bangalore, Virat was batting at a time when some of the top-order players were back in pavilion. He showed exemplary application to score those runs.Even when India were chasing today, it wasn't perfect conditions for batting yet he ensured that India won comfortably." “Virat has been fantastic. On current form, he is the best batsman in the Indian team. He has really grabbed the opportunities provided," said Dravid. Dravid said that the experience of guiding the team to victory in the fourth innings will bolster his confidence. “I’m glad he has learnt from his mistakes and has improved. He had earlier issues about short-pitched stuff but he has improved a lot," Dravid stated. Dravid seemed a bit critical about the "meaningless bilateral ODI series" that are being played. “I believe that all three formats can exist. But ODIs should be restricted to only ICC tournaments like World Cup and Champions Trophy. With T20 cricket coming up big time, I am not sure about the benefit of having five or seven-match bilateral ODI series. While Djokovic had a workmanlike 6-3 6-2 6-2 victory over Frenchman Julien Benneteau to reach the fourth round, the stadium turned rowdy watching Roddick's 7-5 7-6 4-6 6-4 triumph over Italy's Fabio Fognini. Third seed Maria Sharapova survived a scare against Russian compatriot Nadia Petrova to reach the quarter-finals, having trailed 2-0 in the deciding set before a 73-minute rain delay allowed her to regroup and march to a 6-1 4-6 6-4 victory. Other winners included top-seeded Belarusian Victoria Azarenka and defending champion Sam Stosur of Australia on the women's draw and David Ferrer of Spain and Swiss Stanislas Wawrinka on the men's side. The party continued at Flushing Meadows for Roddick, who has become a rock star since announcing on Thursday he would retire after the U.S. Open. New York fans always enjoyed watching Roddick but it has been raised several notches. Fans in Ashe Stadium cheered the 30-year-old American's every move and repeatedly broke into chants of "Let's go An-dy, let's go, An-dy." Roddick, whose 2003 title at Flushing Meadows was the only grand slam he ever won, blasted 10 aces and struck 39 winners in the three-hour match. Roddick will next play seventh seed Juan Martin del Potro, the 2009 U.S. Open winner, who beat Argentine compatriot Leonardo Mayer 6-3 7-5 7-6. "We've had really close matches," Roddick said of his fourth-round match-up. "I was 0-3 against him. I beat him the last time we played. I think of the 0-3, two of them I had match points in. The 7-6 win over Cameroon in the tie-break was an incredible feat, as the African country enjoys a 100-plus points lead over India in FIFA ranking. Dutch coach Wim Koevermans can be credited for this turnaround of the Indian team, after they slipped to a low following the exit of British coach Bob Houghton last year. Houghton had introduced many innovations, but the top brass of the AIFF were not amused by his outspokenness, his ideas for bringing much more dynamism to the game’s administration. When Wilhelmus Jacobus Koevermans was appointed the chief coach on June 15 this year—he took charge only 17 days before the start of the Nehru Cup, though -- the Indian team was beset with dissension and absences. Many players, including Baichung Bhutia, who quit the game last year, were upset at the exit of Houghton. They felt that Indian coaches lacked the necessary knowledge and skill to take the team to higher level. The domestic coaches were caught in a time warp and had little knowledge of the emerging trends in the game. Koevermans was recommended to the AIFF by Technical Director Rob Baan, and the former Dutch international came with a formidable reputation, both as a player and coach. The AIFF zeroed in on Koevermans after extensive search as it felt that he was the right man for the job who could bring in the much-needed change and improvement. On taking over, Koevermans observed that the Indian game had similarities in the style of play with Ireland, the last country he had worked with, though he felt that “there are areas which need improvement”. The 51-year-old Dutch coach was happy with the bunch of players put in his charge, though Sunil Chhetri had joined the camp only a week before the Nehru Cup as he was playing for a Portugal Club. After watching Chhetri in the camp for a couple of days, Koevermans had no hesitation in saying that the Gorkha lad would paly a big role in his scheme of things for the national team. Koevermans has managed to instil great self-belief in the team as even when the chips are down, he keeps faith in the players and eggs on them to go for the kill, whatever might be the final outcome.